Observation - Terrapins - UK and Ireland. 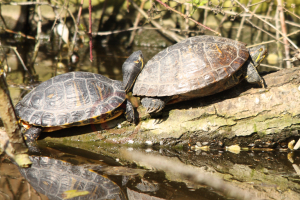 Description: A pair of terrapins from the local canal. Presumable having been dumped there when they stopped being 'cute' pets; they seem to have survived well (as they have in lots of UK waterways). A pair of terrapins from the local canal. Presumable having been dumped there when they stopped being 'cute' pets; they seem to have survived well (as they have in lots of UK waterways).